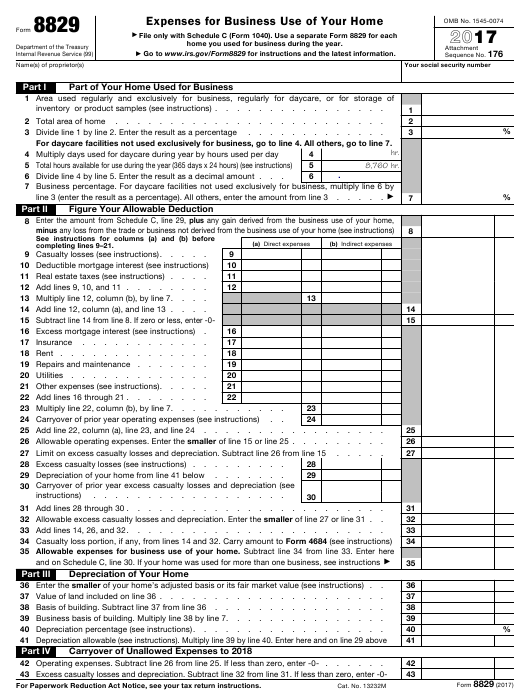 IRS Form 8829 or the "Expenses For Business Use Of Your Home" is tax form released and collected by the United States Internal Revenue Service. The January 1, 2017 fillable version of the 8829 Form can be downloaded below in PDF-format. The "Expenses For Business Use Of Your Home" can be filed digitally and submitted online or printed out and sent to the IRS mailing address. home you used for business during the year. Go to www.irs.gov/Form8829 for instructions and the latest information. inventory or product samples (see instructions) . For daycare facilities not used exclusively for business, go to line 4. All others, go to line 7. 6 Divide line 4 by line 5. Enter the result as a decimal amount . line 3 (enter the result as a percentage). All others, enter the amount from line 3 . 9 Casualty losses (see instructions). 11 Real estate taxes (see instructions) . 12 Add lines 9, 10, and 11 . 13 Multiply line 12, column (b), by line 7. 14 Add line 12, column (a), and line 13 . 19 Repairs and maintenance . 21 Other expenses (see instructions). 22 Add lines 16 through 21 . 23 Multiply line 22, column (b), by line 7. 26 Allowable operating expenses. Enter the smaller of line 15 or line 25 . 28 Excess casualty losses (see instructions) . 31 Add lines 28 through 30 . 32 Allowable excess casualty losses and depreciation. Enter the smaller of line 27 or line 31 . 33 Add lines 14, 26, and 32. 36 Enter the smaller of your home’s adjusted basis or its fair market value (see instructions) . 37 Value of land included on line 36 . 39 Business basis of building. Multiply line 38 by line 7. 40 Depreciation percentage (see instructions). 42 Operating expenses. Subtract line 26 from line 25. If less than zero, enter -0- .